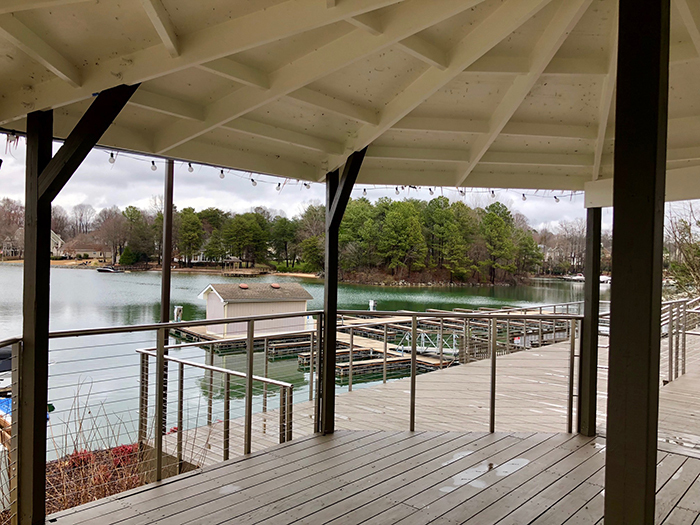 Hello, Sailor, the highly anticipated new lakeside restaurant from Joe and Katy Kindred, opened in early December in Cornelius. If you’re looking to get up to speed on Hello, Sailor and its backstory, here’s our complete Hello, Sailor preview from Katie. Go read it, it’s fast and informative. Surprisingly, early online reviews of Hello, Sailor are mixed. The restaurant has generated a 3/5 rating on Yelp and a 3.3/5 rating on Google Reviews. 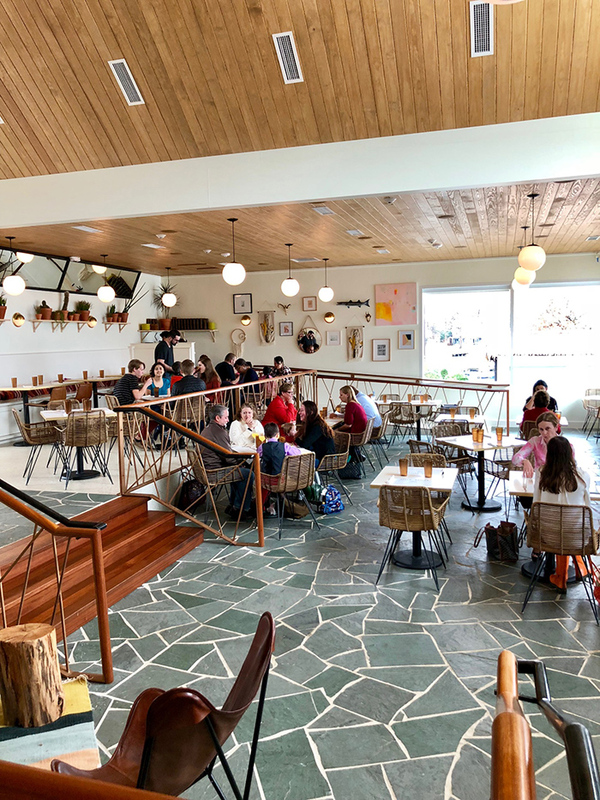 On Sunday, I headed up to Hello, Sailor to experience the restaurant for the first time. Here are 9 takeaways from my experience. (1) It’s an easy drive from Charlotte. It’s a straight shot up I-77, just 20 miles. Took me less than 25 minutes from Uptown. Parking is easy: There’s a huge lot out front. 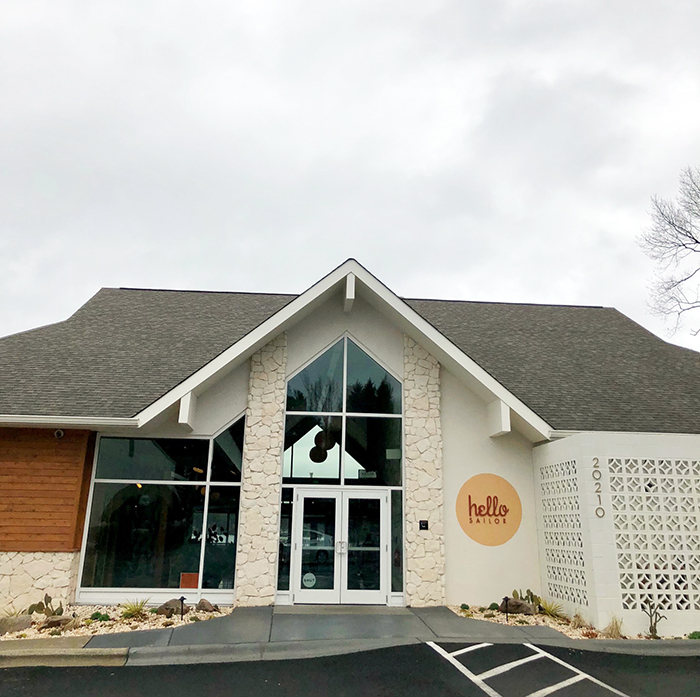 View of the front exterior of Hello, Sailor from their parking lot. (2) Hello, Sailor isn’t Kindred. Most negative online reviews are some version of this statement (both are owned by Joe and Katy Kindred). Guests have such a deep appreciation of Kindred that they immediately compare Hello, Sailor to Kindred. It’s unfair, but it is what it is. Honestly, I give a ton of credit to Joe and Katy for debuting a new concept instead of just cloning Kindred. They’re smart enough to know they were going to get piles of feedback like this. Hello, Sailor is much more casual. Silverware is wrapped in a paper napkin and food is served on plastic trays. It’s got an upscale fish camp feel to it, which I enjoyed – but stands in contrast to Kindred. (3) The space is gorgeous — it’s just one big room that’ll make you think you’re on the set of Mad Men. It’s got a Palm Springs-inspired, mid-century modern vibe and I dig it. If they’re available, sit at one of the three tables in the far left corner with a view of Lake Norman. The only downside of the space is that it’s loud (many negative online reviewers often mention this). 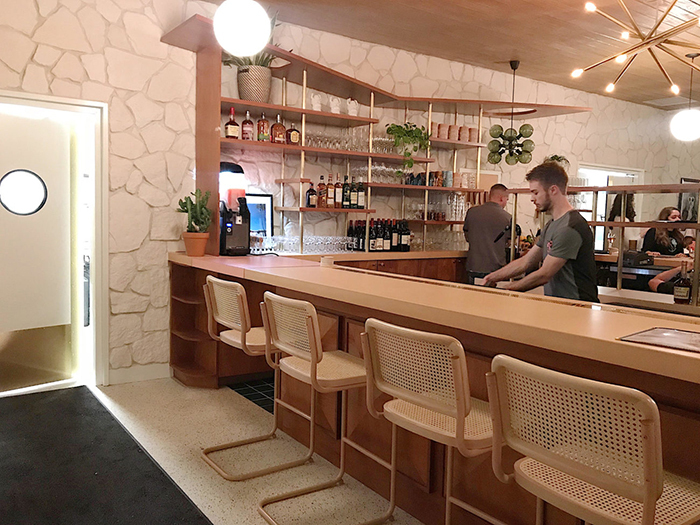 On the right, you’ll find a horseshoe-shaped bar that’s slightly elevated and more cozy than the rest of the space in the restaurant. You’ll notice quirky little details that round out Hello, Sailor’s carefully crafted identity, like a $5 retro photo booth and a merch wall selling branded trucker hats, tees and koozies. 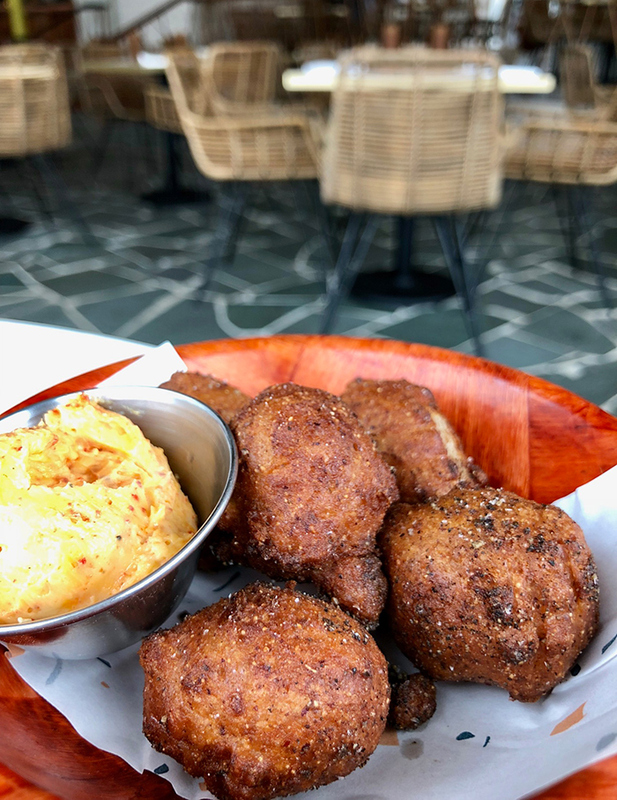 (4) Order the hushpuppies ($3.49). They’re the best I’ve ever had. 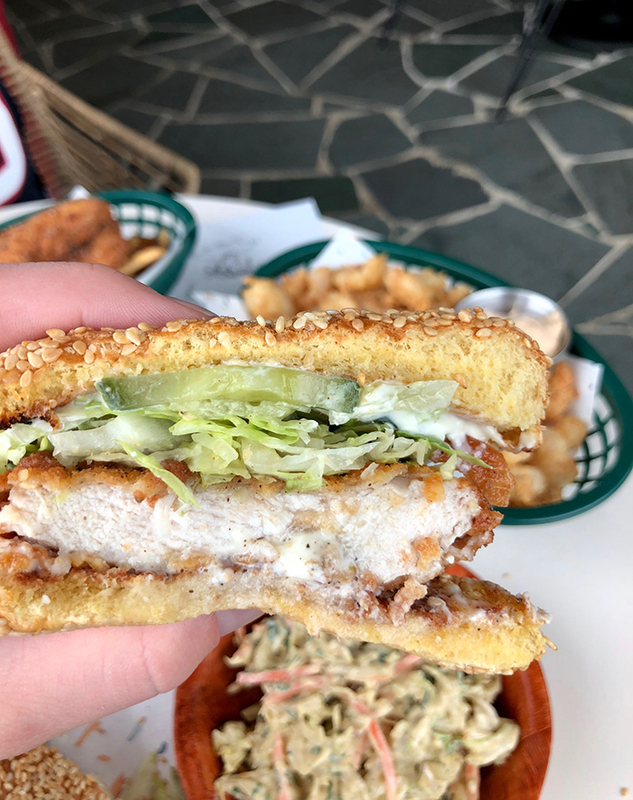 (5) The two most popular dishes are the Carolina Shrimp Calabash Plate ($15) and Calabash Chicken Sandwich ($10). If you’re going big, do the Hamachi Poke appetizer ($12), Bone-In Kanas City NY Strip ($40) and the Lobster Roll (market price). The kitchen is led by Chef Craig Deihl, a two-time James Beard Award finalist for Best Chef in the Southeast. 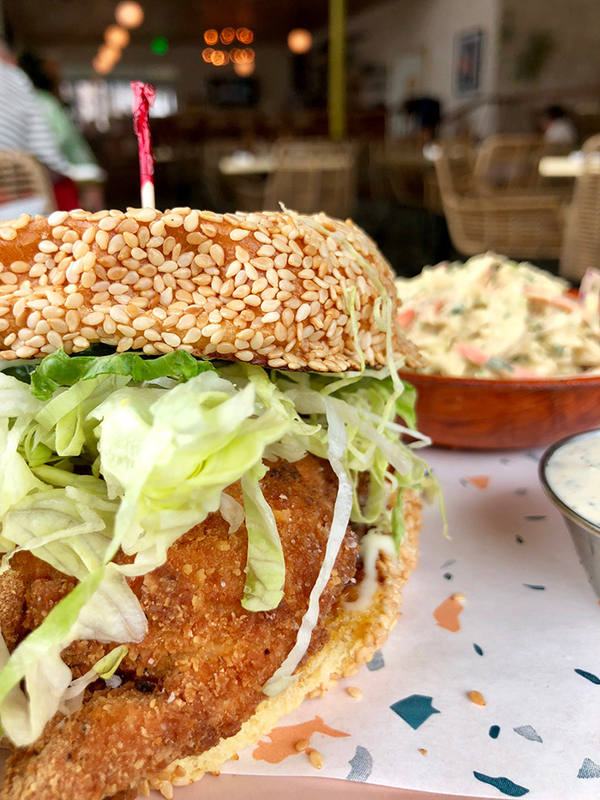 The chicken sandwich comes with your choice of side: salad, fries of avocado slaw. I went with the avocado coleslaw and it didn’t disappoint. 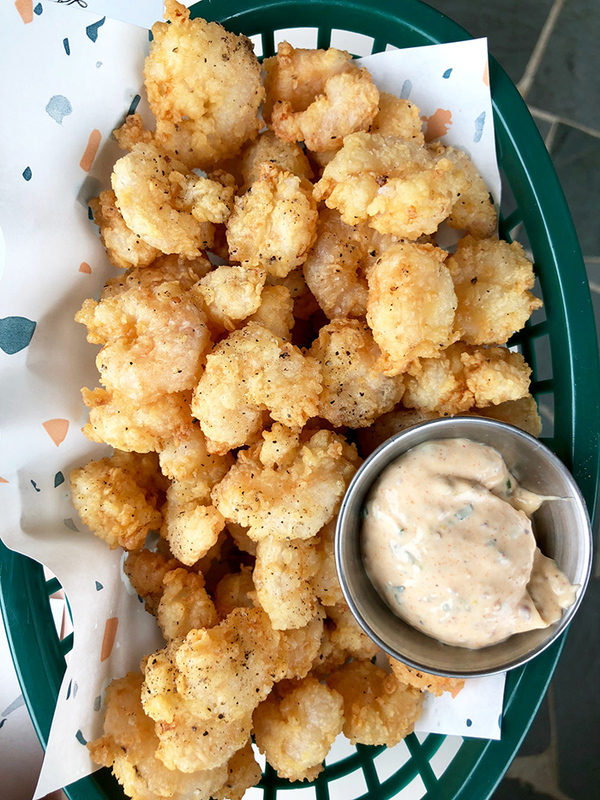 I loved these little popcorn shrimp. Ask for some cocktail sauce too. 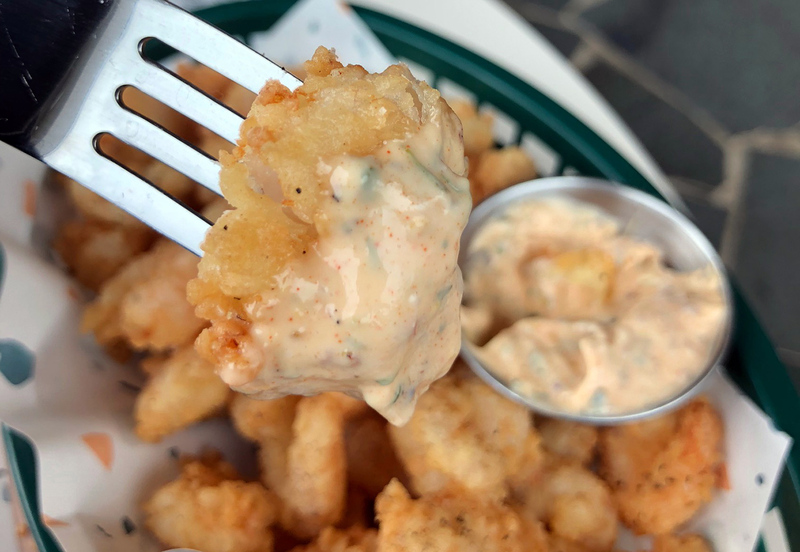 If you’re doing appetizers, the shrimp plate can easily be split between two people. (6) I can understand Yelpers when they talk about Hello, Sailor trying to find its identity. Several online reviews mention that they’re confused by Hello, Sailor. 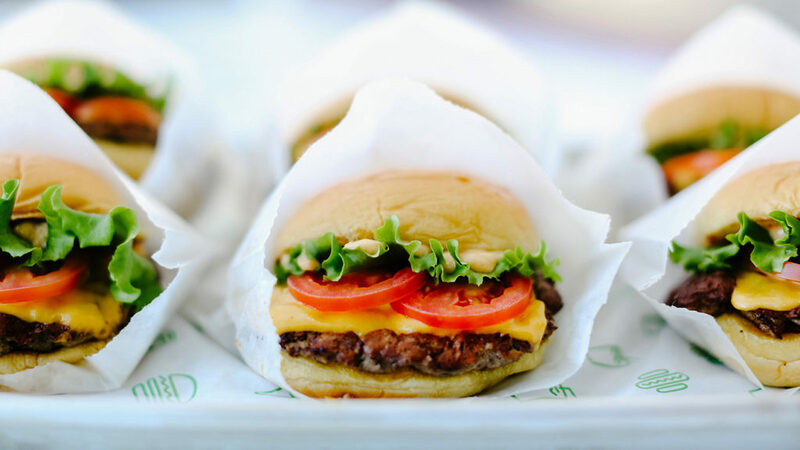 Is it a date spot worth the drive from Charlotte? Is it a neighborhood hangout? Is it the spot you go for a drink after a day on Lake Norman? I’m most likely to head to Hello, Sailor for a Sunday lunch or a date night where I’m going to stay for a while and do dinner, then drinks on the patio. It’ll take a year or two for Hello, Sailor to develop its identity and this identity will ultimately come from their core customers. (7) The tiki bar and waterfront patio are now open and I can’t wait to sip a Mai Tai out there. This area was closed when I visited the restaurant last weekend. The tiki bar, waterfront patio and the restaurant’s 20 dedicated boat slips will no doubt be slammed once the weather is right on weekends. Expect beach-worthy cocktails like Cherry Lemon Sundrop Negroni Slushies and no-frills 40-ounce Miller High Life bottles. 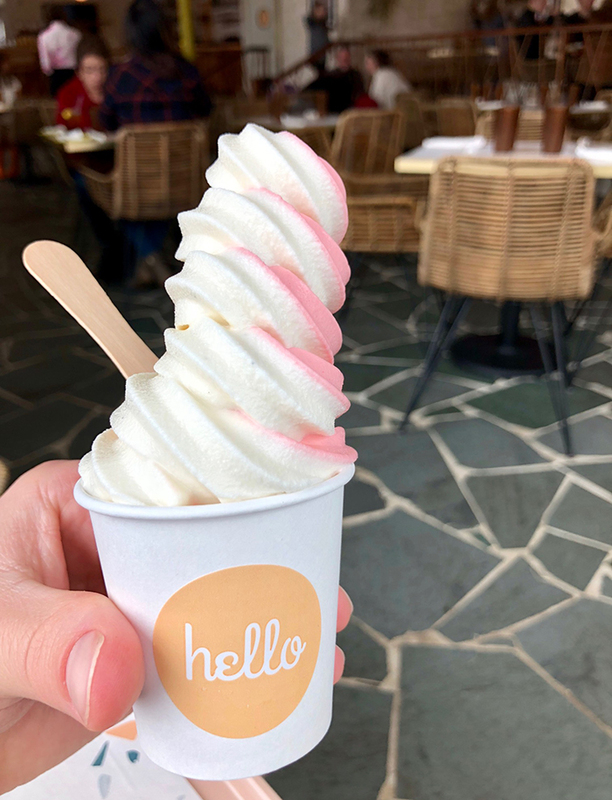 (8) Yes, you must do the obligatory Hello, Sailor soft serve Instagram post. I went with the vanilla and pomegranate swirl ($4) and was surprised at the large portion. Tiny wooden spoon, FTW! Just watch those likes pile up on the ‘gram. 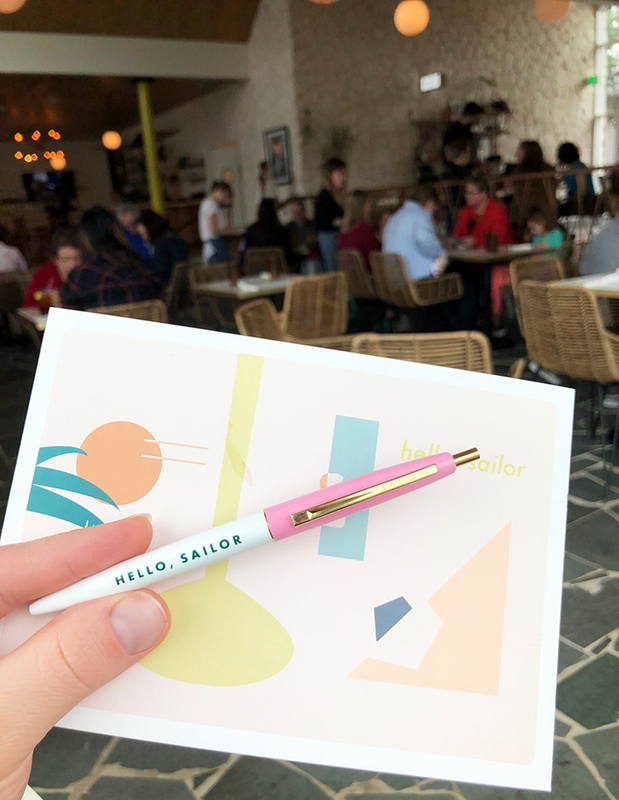 (9) The Hello, Sailor branded pen and postcard that comes with the check is a nice touch. I didn’t know whether or not I was allowed to keep the pen, but I pocketed it. Hopefully the authorities won’t come after me.